This has been a tremendous week for Accessory Genie. More specifically for the GOgroove Panda Pal portable speaker which was spotlighted in all of its adorable glory on CNET.com, yes CNET. For those who are unaware of who CNET is, it's a tech media site which was originally founded in 1994 and has a mammoth following with over 12,000,000 unique visitors. In other words, they're HUGE! For two glorious days CNET has the GOgroove Panda Pal portable speaker featured as an Exclusive Deal at the lowest price anywhere. Besides the cache of being an "Exclusive Deal", both Liza Maloy and Rick Broida from CNET wrote incredible reviews about one of our favorite products. But they weren't just interested in the Panda Pal because of its super cute design or the huge sound it puts out, they want to help Pandas International too. A heart as big as their site. Pandas International is a non-profit organization that has been mentioned plenty here, but that's because what they do is so important that we'll mention them every chance we get. To reiterate to those in the know or to enlighten any novices, Pandas International is dedicated to the preservation of the endangered Giant Panda and its habitat. They were founded in 1999 after the soon to be founders witnessed the plight of the endangered Panda first-hand in China. Since then they have been working tirelessly to raise funds through donations and to educate the public so that future generations can continue preservation efforts. In 2008, an 8.0 magnitude earthquake devastated the Sichuan Province of China. As a result, the Wolong Giant Panda Reserve Center was severely affected. Immediately following the earthquake, Pandas International dedicated itself to raising money to provide medicine, food and electrical equipment to the reserve and neighboring communities. Since then, Pandas International has been concentrating efforts on rebuilding the forested area the pandas call home through their Bamboo Project. Pandas International has several ways that you can help including Pennies 4 Pandas, Adopt a Panda, and Sponsor a Panda. 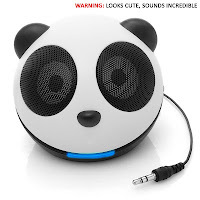 Another way that they're spreading the word and raising funds is through sales of the Panda Pal portable speaker. From June through October 5% of the net profits of Panda Pal sales will be donated directly to Pandas International. Another consideration when purchasing portable laptop speakers is if the unit runs on batteries. If it does use batteries, consider whether it is a rechargeable unit or whether you must replace the batteries each time.